The construction industry is inherently dangerous, and there are measures job site supervisors and managers can take to minimize the risk of construction accidents and injuries. Reliable scaffolding is essential on nearly every construction site, and is typically used to bear heavy loads and provide solid support for crews working at dangerous heights. If scaffolding is defective or poorly maintained, it can create an extremely dangerous situation for everyone on the job site, even those workers who aren’t actually on the scaffolding. If you have suffered injuries in a scaffolding accident on a construction site in Georgia, contact our construction accident lawyers at Rechtman & Spevak today. Our experienced workers’ compensation attorneys in Atlanta can help injured victims protect their legal rights and pursue the compensation they deserve for their injuries. Due to the frequent use of scaffolds on construction sites, scaffolding accidents are one of the most common types of construction site accidents in the United States. According to OSHA, protecting construction workers from scaffold-related accidents would prevent 4,500 injuries and 50 fatalities every year. 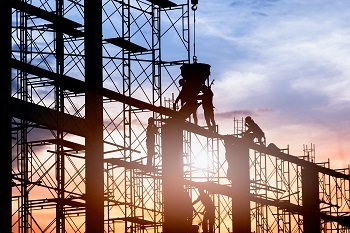 Victims injured in scaffolding accidents in Georgia may be able to file a workers’ compensation claim in order to collect medical or disability benefits for their injuries and treatment. If you have suffered injuries in a scaffolding accident in Georgia, you may be entitled to additional compensation by filing a third-party liability claim if your scaffolding accident was caused by a third party not employed by your employer. If you have been injured in an Atlanta scaffolding accident, or if you lost a loved one in such an accident, contact our construction accident attorneys at Rechtman & Spevak today. You may be able to file a workers’ compensation claim for your on-the-job injuries, or a third-party liability lawsuit against manufacturers who provide defective products or suppliers who deliver worn-out frames and flooring. By taking action against the person or party accountable for your workplace injuries, you can pursue compensation for your medical bills and lost wages due to missed days at work, or funeral and burial costs if your loved one was killed in a GA scaffolding accident. With the help of our Atlanta construction accident lawyers at Rechtman & Spevak, victims of scaffolding accident injuries in Georgia can seek fair and timely reimbursement for their injuries and protect themselves and their family from further harm.